Mmmm simple (ish) and tasty. This recipe was taken from Anthony Sedlak, the host on The Main on the Food Network channel. The issue I was reading was asking each Food Network host what their favorite dish was that they come back to time and time again, and I would have to say I agree with Anthony's choice! Hubby and I try to experiment with different recipes all the time, but I always ask hubby to make this recipe at least once every few weeks, it's not trendsetting food, but it's simple with bold flavor. In between 2 pieces of plastic wrap, pound each piece of pork to ¼-inch thickness. Cut each piece in half. Season with salt & pepper. Spread ½ tsp Dijon mustard on each and sprinkle with thyme leaves. 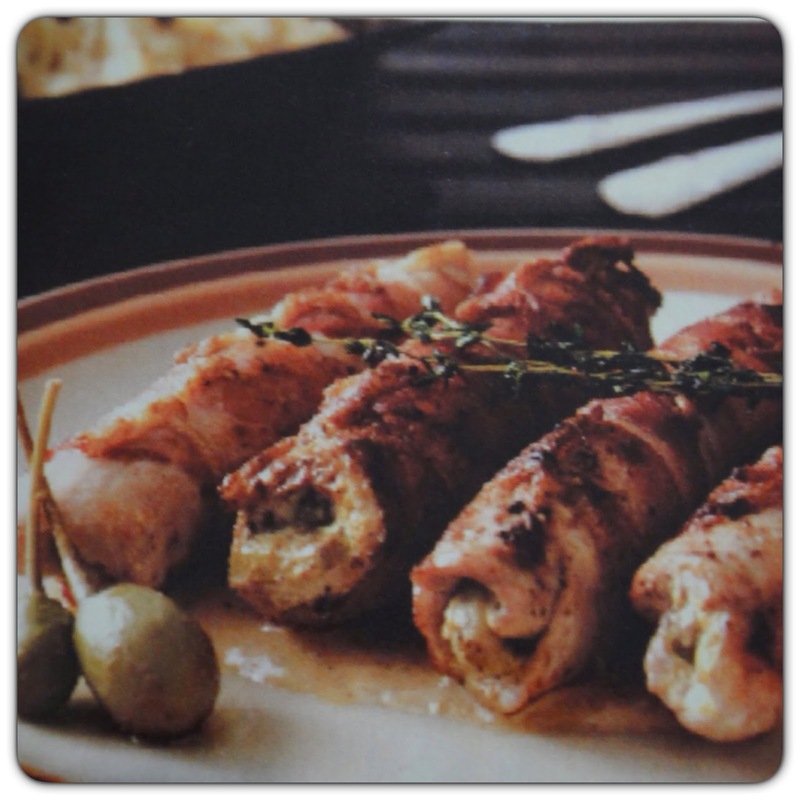 Place pickles on short end of pork and start rolling pork into a rouladin (away from you) and wrap each bundle with a slice of bacon. Pierce with a toothpick to hold its shape. In a large skillet, heat oil over medium high heat. Sear rouladin on all sides, approximately 5 minutes, or until bacon is crispy. Transfer skillet to preheated oven and continue cooking pork approximately 15 minutes until cooked through. While pork is cooking, add ¼ cup white wine to the skillet to deglaze and scrape up all the brown bits. Add remaining ¼ cup white wine, sour cream, mustard and thyme. Stir to combine.